I had an interesting experience when visiting a church on Sunday. Whilst in prayer, I felt I had been given a word... a phrase to be precise. I heard the words "courage in the quiet places"... and to be honest they've stuck in my head because on the face of it, they form a fairly random sentence and it's hard to discern what it actually means. So I've been praying about it over the course of the past couple of days. Wisps of vapour floated up and past him, and he began to sweat. A sound, too, began to throb in his ears, a sort of bubbling like the noise of a large pot galloping on the fire, mixed with a rumble as of a gigantic tom-cat purring. This grew to the unmistakable gurgling noise of some vast animal snoring in its sleep down there in the red glow in front of him. How good a timely word is indeed. The reason The Hobbit quote ties in so well with me, is that I am often very much like a little hobbit stuck in a tunnel... hearing the faint rumbles of dragon breath and watching the walls shimmering with eerie, ethereal glows from as yet unperceived creatures in the adjoining caverns that surround me. I could choose to face any one of those dragons but have a reluctance to do so be it out of fear or uncertainty about whether it is the right battle to fight. A king may move a man. A father may claim a son. That man may also move himself. And only then does that man truly begin his own game. Remember howsoever you are played... or by whom, your soul is in your keeping alone. Even though those who presume to play you be kings or men of power, when you stand before God you cannot say "But I was told by others to do thus" or that "virtue was not convenient at the time", this will not suffice. Remember that. I intend to remember that. Lately I have been feeling more and more forthright and confident in my opinions. While sounding out some of my friends and colleagues over the issues tied to my previous post, I found that one of my closest friends disagreed with me. At the time I got quite flustered about the gulf of difference between our opinions; then I recalled my words about the film Cool Runnings in a previous post... and I reminded myself that his walk is not my walk and his perception of my journey comes from his position on the road which he is standing, on his. If I look Nick Payne, walk Nick Payne, talk Nick Payne and AM Nick Payne... I sure as heck better live Nick Payne. The same applies to all of us. How can we be true to God if we can't even be true to ourselves (and vice versa). 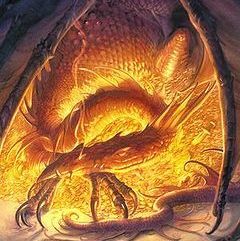 Dragons may come, treasure may await... but whatever we face - be it adversity or ecstasy.,we must do so in our own inimitable God given fashion... with the weapons and gifts he has blessed us with and in the manner he has prepared us. "Courage in the quiet place"
An excellent article. Just found your blog, and am impressed! All too often Christians take courage solely from the fact that they are part of a crowd, collectively, doing the "apparent" will of God. But what if "I" am the only one who sees "it" like it really is? If I am the only one who hears the whisper of the spirit, whose conscience is tweaked over some vital situation. Would I have the faith to continue, alone, secretly? Is my courage, my faith in God, real? Do I need a back up crowd to encourage me and tell me I am "right", and "heroic". It is only in the quiet place, that this is proven. When God alone, will witness what we are truly made of.